In the modern era of cohabiting prior to marriage, traditional gift lists are becoming something of a rarity. Couples tend to have all the pots and pans they need before they decide to get hitched and new gravy boats and coasters are increasingly foregone in favour of contributions towards a honeymoon or simple cash gifts. Many compassionate couples have even begun to refrain from sending a list at all and, instead, altruistically suggest a small contribution towards a favourite charity in place of a gift. We all know, however, that when a wedding invitation drops onto the front door mat the chances are good we’ll be parting with some cash. Usually guests are only too pleased to dig deep and contribute towards the happy couple’s future in whichever way they’ve requested. But not always. There is one scenario where the rustle of a fat invitation, complete with gift list, through the door is met with no small amount of teeth gnashing. 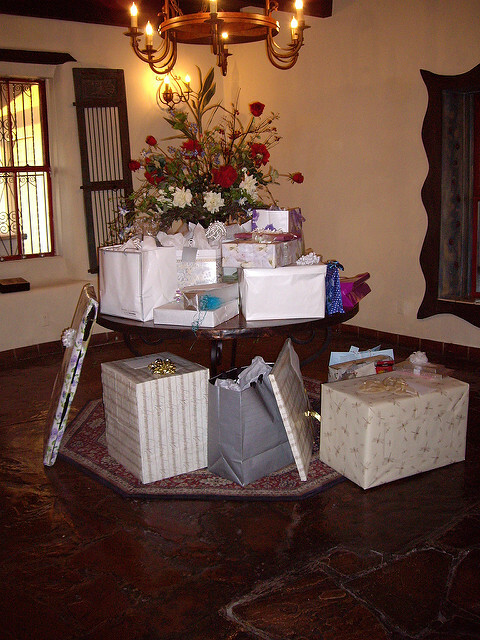 To avoid any resentment it’s wisest to send a gift list only to the people you’re inviting to your wedding AND reception. Guests you invite only to the evening reception, will invariably bring a gift anyway but it’s bad form to expect one from someone who isn’t a close enough friend or family member to be included in the main wedding reception.